Do you love magic? Mark your calendar for March 7-9, 2019 for a chance to participate in an unforgettable weekend of magic in Tennessee. The 45th annual Winter Carnival of Magic is a must for any magician or magic fan looking to improve their skills, meet like-minded magicians, or just enjoy a full weekend of illusions and fun. With a full lineup of activities and sessions for magicians of all ages and exciting live shows open to the general public, this year's carnival promises to be bigger and better than ever. The highlight of the weekend are the two live magic shows at the Country Tonite Theatre, a popular music venue close to our hotel. Featuring an incredible lineup of renowned magicians taking turns wowing the crowd, these magic shows are a must-see for families visiting Pigeon Forge. The Winter Carnival of Magic presents today's top talent all on one stage. You won't find a better magic show in Tennessee all year! When it's not hosting the Winter Carnival of Magic, the Country Tonite Theatre offers a wildly popular variety show for the whole family. Kids and adults will love the live country music, dance routines, and hilarious comedy. Turn your next show at the Country Tonite Theatre into a long weekend when you book a room at our Pigeon Forge hotel just around the corner. Want to see unforgettable illusions and enjoy a mind-blowing show in Pigeon Forge? Every year, the Winter Carnival of Magic welcomes some of the best magicians working in the business today. The stage at Country Tonite Theatre transforms into a magic wonderland filled with classic and all-new tricks that will have you amazed and saying, "How on earth did they do that?" Families will love the carnival because kids of all-ages are welcome to join in the fun. From sleight of hand deceptions and mind tricks, this year's group of magicians will be ready to show off their most impressive illusions. Bring your imagination to Pigeon Forge because anything is possible at the Winter Carnival of Magic. This annual gathering of magicians and magic lovers takes place every winter in Pigeon Forge. There are two parts to the event: a three-day conference with workshops and activities for magicians of all ages and evening magic shows open to the public. The conference takes place from Thursday, March 7th to Saturday, March 9th, while the popular magic shows take place on Friday and Saturday night only. On Friday and Saturday night, the public is welcome to attend the Country Tonite Theatre to see some of the best magicians in the country. Admission is $20 per show for adults and $7 for kids 4-12. Kids under 4 are free. Before the show, you can enjoy dinner at one of Pigeon Forge's family-friendly restaurants. Enjoy local Southern delicacies or grab a burger and fries with your favorite beer to kick off your evening. Check out our favorite places to dine in Pigeon Forge. The conference is open to adults and kids of all ages and offers a full schedule of workshops, lectures, and stage competitions. The convention costs $159 for magicians 18 and over for the entire weekend or $89 for one day. If you are bringing along a guest, companions cost $85 ($65 for one day) , kids 13-17 are $85 ($65 for one day) , and children 4-12 are $40 ($30 for one day). You can find out more information on the calendar of events on the official Winter Carnival of Magic website. Nestled at the base of the beautiful Smoky Mountains, Pigeon Forge is the ultimate destination for an all-ages getaway. Our affordable hotel with free breakfast puts you close to the area's top attractions including Dollywood, WonderWorks, and the Old Mill. If you plan on attending the Winter Carnival of Magic, we have a selection of rooms with mountain views and modern amenities that your family will love. In between sessions at the conference, you can come back to your room and relax in our rooms that come with free Wi-Fi, relaxing massage showers, and kitchen-style perks like a microwave, coffee maker and refrigerator. Our hotel is only two minutes from the Country Tonite Theatre, so you'll never be far from your home base during the Winter Carnival of Magic. Check in earlier in the week to see the famous Smoky Mountains or spend a day at Dollywood. Many of the conference attendees stay at Ramada Pigeon Forge North, so you might even run into fellow illusionists and magic lovers during your stay, especially at the complimentary continental breakfast. 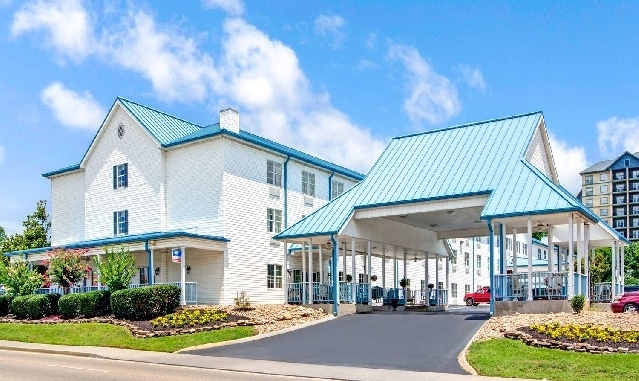 Reserve your Pigeon Forge lodging today.